To give an opportunity for European scientists to realize experiments in the ISS and to coordinate activities onboard the station, ESA (European Space Agency) has created User Support Operations Centers (USOCs), in Germany, Belgium, Spain, France, Denmark, Italy, Norway, The Netherlands and Switzerland. These centers are responsible for the use and implementation of European payloads onboard the ISS, thanks to telescience and remote operations. USOCs carry out tasks related to preparation and exploitation of facilities for experiments onboard the ISS, especially in the European laboratory Columbus. They act as a link between (scientific) users and the ISS. Prior to the launch of payloads, these centers are responsible for operations on the ground model, the creation of procedures for the experiments, optimization and calibration of payloads, as well as training activities for the ISS crew. Once the payloads are in orbit, USOCs operate the payloads for which they are responsible and receive data on the experiments being performed. Besides, USOCs interact with scientists by providing them with data on the experiments ad by processing their requests concerning the experiments and schedule, with the support of the Columbus Control Center (Col-CC), located in Oberpfaffenhofen near Munich. USOCs have different levels of responsibility and expertise. ESC (Experiment Support Centre) responsible for a single experiment and interacting with scientists from their countries. FSC (Facility Support Centre) responsible for a part of an instrument entrusted to another USOC: equipment, insert, experiment container, etc. As such, it brings a technical support to the scientific community in order to implement experiments in this sub-rack. More generally, it supports a FRC USOC. FRC (Facility Responsible Centre) responsible for one or several scientific racks containing various payloads. FRC function: as such, it must be equipped with laboratories with a ground model of the equipment to familiarize users, test and validate procedures and possibly train the crew. It must also have an operational control room for real-time monitoring of experiments (sending commands and receiving data). It is also responsible for pre- and post-flight testing, data archiving and operational maintenance of the associated equipment. CADMOS was entrusted by ESA the responsibility of EPM (European Physiology Modules), MARES (Muscle Atrophy Research and Exercise System) and ACES (Atomic Clock Ensemble in Space). FSC function: experimentally, CADMOS is responsible for most of human physiology activities on behalf of ESA, due to the high French expertise in this field (especially MEDES, a French institute for space medicine and physiology). For instance we can mention CARD or VESSEL-IMAGING experiments to support the Danish Aerospace Company (formerly known as DAMEC). It can also serve the FSC function in other fields, for instance with the DOSIS experiment (radiation measurement) with MUSC. Thanks to CADMOS (and the other USOCs), users have access to the European space laboratory Columbus, after their experiment proposals have been selected by a space agency. Columbus has been docked to the station since 2008. It offers very various space research opportunities. The experiments can be performed automatically or with the assistance of the station’s crew. In this pressurized space laboratory, users have access to three multi-user scientific racks covering the following scientific areas: fluid sciences (FSL), biology (BIOLAB) and physiology (EPM). A fourth rack is not dedicated to a specific field and users can suggest experimental activities compatible with the technical capacities of the rack. 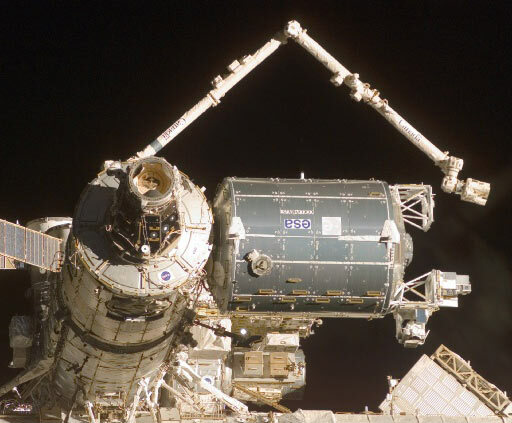 For users who wish to carry out experiments in Earth Observation or technological experiments, requiring to be located outside of the space station (in the non-pressurized part), the Columbus laboratory can provide opportunities : it is the case for instance for the ACES payload, dedicated to demonstrate the functioning of ultra-precise atomic clock in microgravity.